How Kerry Votes Were Switched to Bush Votes. intentional misconduct and illegal behavior...."
Status Report of the House Judiciary Committee Democratic Staff, Jan. 2005.
shifts six percent when the population is sorted by outcomes of wrong-precinct voting. Simply put, Ohio votes were NOT all counted as cast. Many votes were miscounted, and Kerry votes were counted for Bush. Numerous questions have been raised about the fairness of the 2004 Presidential election in the United States of America (US). In this study I focus on one election issue, punch card cross-votinghow votes cast one way were counted other than as intended, as a vote for a different candidate or option. Punch card voting has been replaced and, with so many election issues, this most egregious of flaws—counting votes wrong—has seemingly been overshadowed by e-voting and reform concerns. I also focus on a particular region with one-tenth of the Ohio vote, Cuyahoga County, where recount crimes have detracted from miscounting the vote. The 2004 recount issue focused attention away from cross-voting. Cross-votes recount the same and, hence, are an entirely distinct issue. In 2000, the US post-election focus was on Florida, on fairness of punch card voting, on vote count accuracy, and on incomplete counting. In 2004, Ohio's failure to replace punch card voting with improved systems is just one of many issues raised with regard to the Ohio 2004 Presidential election. Other Ohio fairness, fraud, and irregularity issues include politicization of process, voter registration fraud, voter purging and suppression including racial discrimination and unfair voting machine distribution, the exit poll inaccuracy, electronic voting security, paperless e-voting, e-vote flipping, the high percentage of and unequal distribution of undervotes, uncounted provisional ballots, vote count secrecy, recount crimes and irregularities, and official loss of and/or destruction of evidence. This article and the appendices combine, with additional material, earlier versions cited in academic references. In a separate file, I present a 2004 Ohio Presidential Election Results Summary and various Ohio datasets. Ohio Kerry voters, could have cross-voted at an adjacent precinct using the wrong ballot order. Download vote_switching.ppt featuring highlights from the study. Download ohio_figures.ppt featuring graphics from the article. Download precinct_switching.ppt featuring evidence of election fraud. cuyahoga_precincts.mdb - 912 Kb Access file. 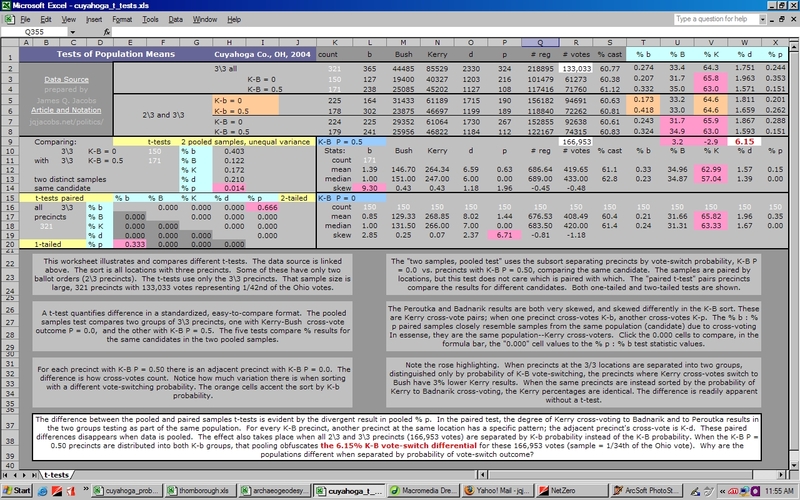 Spreadsheets used in the initial analysis were updated online in July 2006 with cross-vote probability sorting and related charts. Missing data for several precincts was located and inserted and slight errors were corrected. Precincts and locations were resorted, cross-vote probabilities for all precincts and locations were determined, probability subsets were sorted, probability sorts were analyzed and compared, and statistical summaries were added. Significant statistical anomalies are highlighted in the spreadsheets. I consider the data reliable. Let me know if you detect any problem whatsoever. The contents links allow readers familiar with some aspects of the issue to focus on specific topics. The subject is complex, and introductory material is conveyed throughout the topics and in the appendices. This topic required defining vocabulary and creating new notations. These are defined throughout the article and discussed in the appendix. Cleveland Paper Cites Voter Problems, Votes Assigned to Wrong Candidates AP, 12/11/04, "approximately 1,000 voters in the two precincts cast ballots just steps away at machines meant for the other precinct." I was astounded to discover that an election could be so flawed in design. I wondered, "Why would two ballot orders be used in one location if votes could be switched?" and then, more importantly, "How many votes were switched, and to whose advantage?" "How many votes were switched?" should be an easy number to define, I initially surmised. Wrong-precinct voting occurred at a surprisingly high rate. Instead of immediate clear answers, trying to tally the miscounting led down a long path with many more questions, taxed my knowledge of statistics and quantitative methods, necessitated developing new methods, and produced unexpected findings of unfairness in the election process—all providing a political education my political science classes never even considered. The evidence raises suspicions about intentional manipulation of the election process directed at changing the outcome in favor of Bush. I soon wondered, "Were ballots fraudulently switched?" For Ohio punch card voting, accurate tally is dependent on precinct chain of custody, from giving the voter a ballot until central tabulation. Ballots must be cast and counted in their own precinct. Many votes were counted for the wrong candidate or ballot option, and a significant portion of the cross-voting resulted in Kerry votes tallied as Bush votes. The 2004 Presidential election hinged on the Ohio results. According to unadjusted exit polls, Kerry won Ohio. 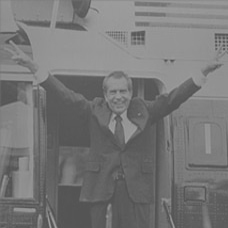 Instead, with a 3.35 percent difference between the tallies, the results gave the victory and the presidency to Bush. With these circumstances, evidence of miscounted voting and Kerry-to-Bush vote switching have particular importance in determining the actual intent of Ohio voters, the reasons for the exit poll discrepancy, and the validity of the 2004 US Presidential election result. Cross-voting also impacted other races. Analysis of past elections and other counties and races may reveal more punch card cross-voting. I present evidence of cross-voting and of how Kerry disproportionately lost votes to cross-voting. I report how ballot order combinations favored Kerry to Bush cross-voting. I present methods developed to determine how many votes were switched, miscounted, or not counted at all. I report the impact of cross-voting and present evidence of the degree of miscounted voting. Finally, statistical tests are applied to the data. Analysis of election results—because every respondent has been polled—is, largely, descriptive statistics, enabling robust statistical analysis without some margin of error problems of sample polling used in inferential statistics. To keep elections fair, Ohio candidate names rotate to the top of the ballot list an equal portion of the time, a statutory requirement. Election officials ensuring this equal rotation combined differing ballot orders at locations shared by several precincts, creating an opportunity for fraud and a problem greater than the one the law seeks to solve. Instead, in punch card voting Ohio —72.4% of the 2004 vote, multiple ballot orders resulted in the unfairness of wrong-precinct voting. I define "wrong-precinct voting" as ballots cast for one precinct then counted with a different precinct's ballot order, possibly counted other than as intended. With greater specificity, I define the hyphenated term "cross-vote" as a vote counted other than as intended. Wrong-precinct voting does not result in "cross-voting" when the precincts share the same ballot order. Cross-voting is plainly and unequivocally evidenced in the Cuyahoga election results. Cross-voting can occur in several ways. Wrong-precinct voting occurs if voters inadvertently punch their ballot with another precinct's voting machine. With multiple ballot orders at a location, cross-voting can result. Cross-voting also occurs when, anytime after voting and before counting, ballots are switched to a precinct with a different ballot order. This study addresses the evidence for cross-voting without distinguishing or quantifying causes. Significant chain of custody concerns exists with ballot transport to central tabulators as well as with ballots at precincts. Wrong-precinct voting, innocent or directed, and ballot switching, whether fraudulently stuffing ballot boxes or by inadvertence, all have the same effect and their specific causes are not readily distinguished in vote results. Herein cross-voting and vote-switching refers to the process, the change of the vote count, without distinguishing a motive or reason. I define the hypenated term "vote-switching" as major candidate cross-voting. One major candidate cross-vote changes the election margin by two votes—as one major candidate loses a vote the other gains the cross-vote. Distinguishing vote-switching from cross-voting is important because impact on the results varies depending on for which candidate the cross-votes count for. Vote-switching can result when the two major candidates are collocated in the same ballot order position, either by switching ballots between such precincts or by voters cross-voting at the location. Location specific examples illustrating and comparing the cross-voting and vote-switching variables follow the ballot order discussion. Cross-voting, when unequal, alters election results and therefore presents opportunities to manipulate election results. And vote-switching doubles the impact of cross-voting. Influencing where and how much cross-voting occurs, and especially if cross-votes are switched-votes, dramatically changes the results of an election, and possibly the outcome. Statistical results evidencing patterns of cross-voting and vote-switching infer whether wrong-precinct voting is random and inadvertent or likely fraudulent. Understanding the cross-voting patterns requires knowledge of the ballot orders and how they were combined. The Ohio ballot order was sequenced alphabetically and Ralph Nader was converted to disqualified. Table 1 shows the five 2004 ballot orders and their sequence. The number of votes for "d" was not reported by Cuyahoga County election officials. The official results indicated the number of recorded votes for the four candidates only and the number of ballots cast. Hence "d" herein is an uncounted catch-all for no selection, hanging chads, and cross-votes (or votes) for disqualified. I define the term "non-vote" as the "disparity" (d) between the reported number of ballots cast and the number of votes counted. The term "undervote" is a synonym, and properly applies to races without an uncounted option. Retaining an empty slot in the order and not reporting voting for that option is unique. 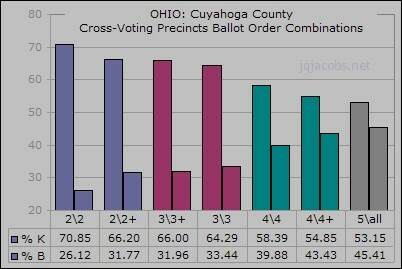 Therefore, in the Cuyahoga cross-voting context, non-votes have unique implications. Not reporting their tally obfuscates evidence of the voting irregularities and, in the context of fraud, it is a cover-up. 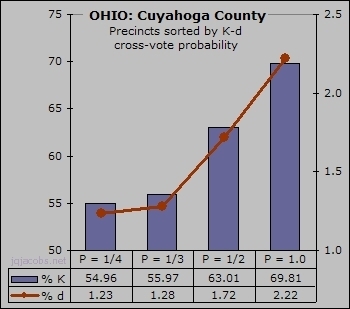 Although "disqualified" cross-votes remain unreported for Cuyahoga County, deviations from statistical normal in the numbers of non-votes infer the degree of and locations with cross-voting, just as do third-party tally patterns. Both third-party candidates received lower vote percentages than the non-vote percentage. Since all three are low percentages, even small amounts of cross-voting are obvious on visual analysis and are statistically quite significant. Table 1. Five Ohio 2004 Presidential Ballot Orders. The ballot order symbols, throughout this article and the spreadsheets, are: b = Badnarik, B = Bush, K = Kerry, d = disparity/disqualified, and p = Peroutka. In Table 1 in the first ballot order, a vote for Bush (B), if counted with the second ballot order, becomes a Kerry vote (K), a vote-switch producing a difference of two votes in their margin. All possible combinations and the cross-vote outcome probabilities of the combinations are discussed below. Note in Table 1, for any Kerry vote there is another ballot order where that vote will count for Bush instead (or for any other option, of course). Obviously, the entire chain of custody—from giving the ballot to the voter until central tabulation—had to be conducted properly for each vote to count as intended. Tables 2 to 5 display the 26 possible ballot order combinations at multiple-ballot-order locations. Where Kerry cross-votes switch to Bush votes (K-B) the cells are rose-tinted to distinguish the Kerry-to-Bush vote-switch probability (K-B P). Table 2 shows the 10 possible combinations at locations with two ballot orders. Columns on the right present how major candidate cross-votes would be tallied. If chain of custody is violated at two ballot order locations, only one possible cross-vote outcome exists for each candidate selection. Table 2. Ten Possible Two Ballot Combinations. Table 3 presents the 10 possible combinations at locations with three ballot orders. Five of these combinations have two precincts that switch Kerry cross-votes to Bush, while the other five have only one precinct that can do likewise. The right column presents the pattern, with two possible Kerry cross-vote outcomes for each precinct. Table 3. Ten Possible Three Ballot Combinations. Table 4 presents the five possible combinations at locations with four ballot orders. Each precinct cannot cross-vote one other ballot position, so three of four precincts can swap major candidate votes, and for each of those three, only one of the three possible cross-votes results in vote-switching. Table 4. Five Possible Four Ballot Combinations. Table 5 presents the possible cross-vote scenarios at locations with five ballot orders. All precincts can cross-vote, but only one of the four other orders produces vote-switching. Only in this one subset, with all five ballot orders, are cross-vote outcome probabilities evenly distributed rather than otherwise fixed. Table 5. All Five Ballot Orders Combined. As seen in the 26 possible combinations above, how many ballot orders and how the precincts are combined at locations determines how cross-votes tally, that is, determines outcome probability for location cross-voting. 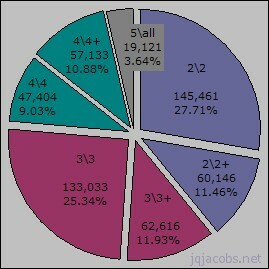 The overall cross-voting outcome probabilities are presented following the next section. only then, are the probabilities of cross-vote outcome equal for all candidates. The first question I tried to answer was, "How many votes were switched?" Cuyahoga County reported, for the 1432 of 1435 precincts included in this study, 1,003,435 registered voters cast 600,467 votes at precincts, 10.76% of the Ohio vote. Since John Kerry received 65.67 percent of these (394,354 votes), on average Kerry would lose two votes to wrong-precinct voting for every vote Bush loses. This, of course, assumes random distribution of ballot order combinations, cross-voting, and vote-switching in relation to candidate support and other variables. It also assumes ballots were counted in precinct as cast, not switched between precincts later to alter votes. With candidate support varying widely in precincts, where wrong-precinct voting occurs determines the ratio of lost votes and the proportion of vote-switching. The cases following illustrate the variable impact of wrong-precinct voting. Table 6 displays results for the most egregious of obvious cross-voting locations, Benedictine High School. Here major candidates were not collocated. Up to 215 people in precinct 1806 cross-voted for Kerry in precinct 1814, punching the third position using the precinct 1814 voting machines. Those 215 Kerry votes counted for Peroutka (K-p) due to the K-p ballot order collocation. Also, up to 164 Kerry voters from 1814 punched the first position, Kerry in precinct 1806. Those 164 ballots counted as Badnarik votes, the first position in precinct 1814. Meanwhile, Bush lost 10 votes to Peroutka in precinct 1814. Table 6. Benedictine High School Voting Results and Ballot Orders. The Benedictine High School tally demonstrates how the number of votes lost to cross-voting is proportional to candidate support. The greater the candidate's support, the greater the negative impact of cross-voting. Kerry lost about 38 times more votes than Bush, 379 votes or 37% of his vote in this location, about 1/1,000th of his votes in the entire county. Kerry votes would increase by up to 60% without this cross-voting. In these precincts Kerry had 96% support, so 24 of 25 random cross-votes would be Kerry voters. Table 7 illustrates two precincts where Bush and Kerry votes can be switched by wrong-precinct voters punching the third position of the ballot order. Kerry voters from precinct 2908 punch the third position (K) on 2909 machines, in their precinct a Bush vote. These Kerry cross-voters cast a vote-switch between the major contenders—the one vote that counts twice. Table 7. Collocation of Major Candidates. Table 8 presents the voting results. The precinct 2909 Kerry cross-voters voting in 2908 tallied for disqualified (K-d) in their own precinct. Bush voters from precinct 2908 voting in precinct 2909 voted the second position, Badnarik (b) in their own precinct, while Bush votes from precinct 2909 vote-switch to Kerry in 2908. Table 8. Location Voting Results. Conclusively, third-party "cast" votes average less than one vote per precinct. In all those precincts with zero probability of a Kerry cross-vote counting for Badnarik, Badnarik garnered a mere 0.20%, compared with 1.02% in precincts with a 1.0 probability of Kerry cross-votes counting for him, a five-fold increase. For Peroutka, the percentage jumps nearly ten-fold from 0.168 to 1.604. Figure 1 illustrates the pattern. Now, presumably 14 Bush voters in precinct 2908 cross-voted in precinct 2909, where punching the second candidate counted for Badnarik in their precinct. Bush probably lost 14 votes, 14 of the 15 votes counted for Badnarik. Figure 1. Some Third Party Results. Badnarik votes increase five-fold and Peroutka votes jump over nine-fold. Kerry-Bush switched-votes are not as readily apparent, obfuscated by higher percent returns, so this example employs hypothetical proportions. Assuming candidate support in the location is 2:1 and that an equal proportion of Kerry voters cross-voted, then 28 precinct 2908 Kerry voters would punch the third position in 2908 and mistakenly vote-switch to Bush. If in precinct 2908, Badnarik gained 14 Bush votes while 28 Kerry votes switched to Bush, the margin between Bush and Kerry changed by 42 votes in Bush's favor, a 17% shift. Comparing Table 8 and Table 9 illustrates how cross-voting hypothetically altered the Kerry's vote by an 11.67% drop, to 65.26% from 73.72%. Table 9. Results without Hypothetical Cross-Votes. Of course, in a hypothetical scenario assuming random cross-voting, voters from 2909 also cross-vote. For these voters, the ballot order combination creates different results. In position 3, Bush voters cast votes counted for Kerry while Kerry cross-voters punch disqualified. The number of disqualified votes indicates the maximum number of Kerry cross-voters, up to 24. Assuming all 24 of the precinct 2909 disqualified votes are Kerry cross-voters and, once again, half as many Bush voters also cross-voted, Bush gets back his 12 votes and Kerry nets 12. Accounting for these cross-votes, precinct 2909 voting would have resulted as shown in Table 10. Table 10. Results without Hypothetical Cross-Votes. For the two precincts, Kerry should have garnered 70.03%. Instead he received only 63.72%, a drop of 6.3%. Bush started with 25.7% and ended with 26.0%, or a gain of only 0.315%. The Kerry margin over Bush shrinks by 6.0%. But this scenario began using understated, after-cross-vote results to determine the Bush and Kerry voter proportions! There likely were actually 3 Kerry voters for every Bush voter, so for every 14 Bush cross-voters there should be about 3 times as many Kerry cross-voters. Our first order computation only used twice as many. Recalculating with the 3:1 voter ratio, the Kerry lead increases by 78 votes in the two precincts, a net impact of a 10.87% shift in the margin. The Ohio raw exit polls' disparity with the Kerry vote is 3.35%. 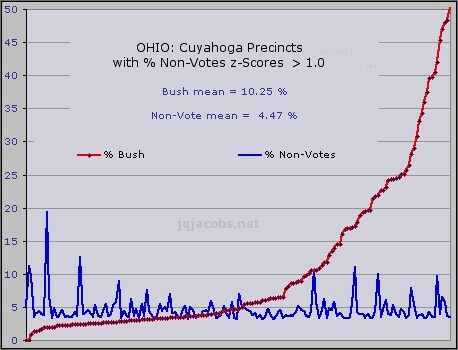 By comparison, if a net 1.05% of Ohio Kerry votes switched to Bush, the election outcome was altered. The net impact of cross-voting is significant, especially with switched-votes. The degree of impact of cross-voting seen in this scenario and the third-party cross-voting above certainly brings into question the validity of the election results. The Euclid voting location, in Table 11 below, illustrates two-ballot-orders without Bush and Kerry collocation. Bush cross-votes count as d or p, Kerry cross-votes count as p or b. In precinct 3943, it appears Kerry lost up to 93 votes to Peroutka. Kerry is collocated with Peroutka, Bush with disqualified. There are no disqualified votes in precinct 3943, so no Bush voters cross-voted. If the ballot order in this case had instead switched Kerry votes to Bush votes, with only one party cross-voting, no direct evidence would exist of cross-voting at the location, excepting statistical evidence of course. In the light of such possible hidden vote-switching, this case is particularly alarming. It illustrates how vote-switching can be completely hidden, unrelated to minor candidate and non-vote results. Was vote-switching intended in this instance? Did someone switching ballots err, thinking this ballot-switch changed Kerry votes to Bush? And undetected at that! This instance forces the question, "How did one-party cross-voting occur?" Table 11. Location with Cross-Voting Irregularity. This location also forces the question, "Were up to 93 ballots switched to a different precinct after voting and before counting?" I do not know. Disparity of precinct populations (72 votes to 403) may have driven voters to empty machines in the smaller precinct. But why only Kerry voters? Did poll workers distinguish party affiliations and manipulate wrong-precinct voting? Or, did someone switch the ballots after the voting? If this case is not fraudulent, then Kerry lost up to 93 votes to Peroutka because, suspicious and improbable as it is, only Kerry voters in 3943 cross-voted. A smoking gun like this should cause an election irregularity investigation. Why this did not, and still does not, is a mystery. These examples evidence cross-voting and possible election fraud, and more evidence is interwoven in the following sections. The amount of cross-voting is expected to be random when accidental and unwitting, but if manipulated to alter the outcome, of course the expectation is that it will be non-random and biased. Precinct level analysis indicates cross-precinct voting is not randomly distributed, producing one more mystery not easily answered, especially not from data, "Why is cross-voting unevenly distributed?" Cross-voting changes the results substantially. Cross-voting favors the candidate with the least support. Not every ballot order combination switches major candidate votes. 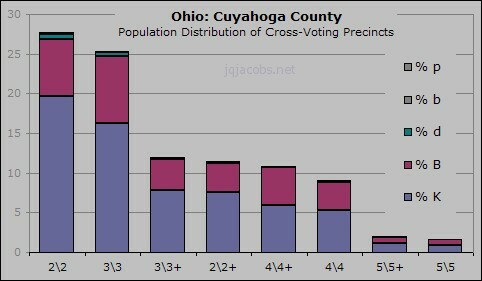 Cuyahoga County non-voting rates for the 2004 Presidential race uniquely presents two issues. Ohio 2004 is unique because, first, the ballot had an empty candidate position and, secondly, in Cuyahoga County votes for "disqualified" remain uncounted. Typically, all cross-votes count for a wrong candidate, and therefore, under-voting is only an uncounted votes issue. In Cuyahoga 2004, because only four of five ballot options are reported counts, the cross-votes for disqualified remain covered up and the degree and locations of cross-voting are obfuscated, masked as no vote. In a separate article, I discuss non-voting/undervoting in a national context. In this analysis, I am concerned with non-voting resulting from cross-voting to disqualified. Non-voting, like the third party voting, evidences cross-voting. 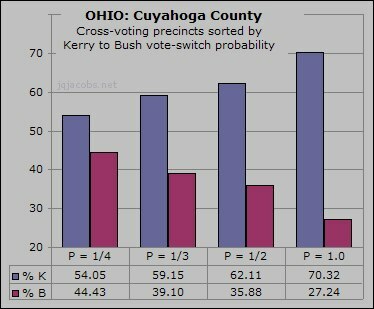 Given Cuyahoga County's reported 32% support for Bush, 2/3 of random cross-votes were likely Kerry votes, including non-votes due to cross-votes to disqualified. Third-party voting and non-voting was not randomly distributed. The percentage of ballots not counted as votes increases with Kerry support. The precinct-level correlation of non-votes to Kerry votes is 0.423, while to Bush votes it is negative, at -0.50 (Figure 2). Cuyahoga non-votes included any candidate votes not counted (i.e. hanging chads, other spoilage) and no vote cast for president. In some states, the undervote percentage is well below one percent. Ohio recorded near the highest rate in 2004. Ohio's state-wide non-vote rate for e-voting was near normal, at 0.76% compared to 1.90% for punch card voters. However, precinct level analysis indicates that many punch card precincts had normal non-voting percentages. Non-voting distribution is skewed rather than random and correlates with Kerry support. Figure 3 illustrates the non-vote results for precincts sorted by the level of Kerry support. The non-vote rate is more than three times the normal expectation in precincts with highest Kerry support. Suspiciously, where cross-voting reduces Kerry's vote the most, the non-vote rate is highest. The rate jumps significantly in precincts which reported more than 70% Kerry support. Figure 3. Kerry Support and Non-Voting Rates. 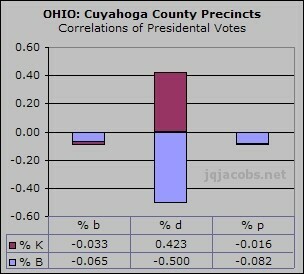 Figure 4 displays Bush and non-votes percentages for all Cuyahoga precincts with over 3.6% non-votes. This sort represents 11.0% of the ballots cast and 27.7% of the non-votes. Non-voting is over four times normal in these precincts. Nearly all have over 75% Kerry support, many have over 90% Kerry support. Bush's mean tally in this group is 10.25%. Figure 4. Cuyahoga precincts with greater than 3.6 % non-voting, more than one standard deviation from the mean non-vote percentage (1.80%). In Cuyahoga County, Kerry lost a very high, non-random proportion of the uncounted votes. This cross-voting/undercounting concentration where it lowers Kerry's tally the most raises suspicion of irregularities and presents yet another mystery, "Why is undervoting concentrated in locations with the highest Kerry support?" It appears Kerry was robbed of votes! Multiple ballot order locations constituted 87.6% of the Cuyahoga precincts. Using standard probability (P) notation, the probability that a voter could cross-vote, based on actual number of ballots cast, was P = 0.875. Seven of eight ballots were cast at precincts with possible cross-voting, and over 525,000 votes were recorded, 9.2% of Ohio's vote reporting 64.6% Kerry support after the cross-voting. The Cuyahoga County multiple ballot order locations represent 12.75% of Ohio's reported Kerry votes. In summary, seven-eights of voters in Cuyahoga County—including more than one of every eight Ohio Kerry voters—could have voted at an adjacent precinct using the wrong ballot order. Of the 525,172 possible cross-voters, 260,988 could vote-switch Kerry-Bush at an adjacent precinct. I wondered, "How many Kerry votes were switched to Bush?" Probability calculations are unabashedly simple. Flip a coin with two sides, the probability that one side will be up is 1/2. For two mutually exclusive events such as heads or tails, P = 0.50. Given five vote options with more precincts than ballot orders at some locations, the probabilities are more complex and yet readily determined. Table 12 presents the random probabilities of major candidate collocation. Of course, at individual locations, the precinct probabilities differ according to which ballot orders are combined with which others. Locations with three precincts and two ballot orders, for example, can have two precincts that switch Kerry votes to Bush votes and only one switching Bush votes to Kerry votes, hence the vote-switching probabilities are K-B P = 2/3 or B-K P = 1/3. Conversely, where voters can wrong-precinct vote using the same ballot order as their own precinct, the probability that wrong-precinct voters will cross-vote is reduced. Table 12. Random Probability of Major Candidate Collocation. When flipping a coin, we are assured that the number of heads and tails are equal. The odds are 50/50, heads or tails, for 100 coin tosses ONLY if both heads and tails are on the coin 100 times! With dice, the odds are one of six, etc. Cuyahoga County election officials decided how many and which candidates were collocated at which locations, who appeared together for each roll of the dice, how many sides the dice had, even which candidate appeared on several sides. A complex pattern of skewed probabilities emerged from analysis of the actual ballot order combinations. Initial analysis revealed that Kerry received 8.9% fewer votes at locations where voters could cross-vote. Further inquiries demonstrated that ballot-order combinations, but not ballot orders, had a surprising correlation to the results. When all precincts are sorted by the five ballot orders, the Kerry vote percentage varies normally, from 65.3 to 66.1 percent. That range increases significantly, varying from 60 to 77 percent, when all precincts are sorted instead by ballot order and precinct combinations. The next section addresses this variation in relation to precinct and location cross-vote outcome probabilities. Table 13 and Figure 5 illustrate the distribution of cross-voter subsets using percentage of the whole. Almost all voters had non-random probabilities of cross-vote outcome. The largest subset, 2\2 locations with 27.7% of cross-voters, always has 1.0 probability of location cross-vote outcome since only one other candidate can be in the same ballot position. Over 3/4ths of potential cross-voters, 77.6%, voted at locations with only one or two possible cross-vote outcomes. Only 1.7% of cross-votes, those at locations with five precincts and five ballot orders, had equal probability (P = 0.25) a cross-vote counted for one of four other candidates. Cross-vote outcome varies by precincts rather than locations, therefore I defined cross-vote outcome probabilities for each precinct. Analysis with precincts sorted by cross-vote probability reveals the impact of cross-voting—both by accounting for how cross-votes tally and by distinguishing vote-switching. 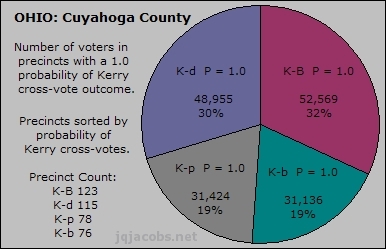 I codified wrong-precinct voting using Cuyahoga's majority voter, the Kerry voter. Hence, the short-hand notation K-b, K-B, K-d, and K-p represents the four cross-votes, and K-K represents wrong-precinct voting or ballot switching with the same ballot order. For example, K-B P = 1.0 represents Kerry-Bush vote-switch probability equals 1.0. The datasets use this notation and display analyses of probability sorted subsets. Table 14 presents probabilities of vote-switching at precincts with collocated major candidates. As is readily seen, when the number of ballot orders at the location increases, the vote-switching probability decreases. Random cross-voting has a certain outcome only at locations with two ballot orders. Cross-vote outcome can also be certain when non-random, if the voter is directed to cross-vote or when ballots are precinct switched after votes are cast. At the central tabulation site, these location cross-vote limitations do not apply of course, since any two precinct's ballots can be switched. Analysis using location probability subsets identifies location related chain of custody error. Table 14. Probability of Vote-Switching with Major Candidate Collocation. will be switched GIVEN major candidate collocation in the location's ballot orders. At locations with more precincts than ballot orders, some wrong-precinct votes count as intended. Table 15 presents cross-vote probabilities for the ballot order\precinct (BO\P) subsets. The + notation, 2\2+, 3\3+, etc., represents locations with more precincts than ballot orders. The greater the number of precincts, the less likely the wrong-precinct vote counts as intended. Given the subset probabilities in Tables 14 and 15, reconsider the subset population distribution in Table 13. Ballot order subset distribution favors the probability of vote-switching. The two largest groups, the 2/2 and 3/3 locations—over half the population, have P = 1.0 cross-vote probability—meaning their K-K P = 0.0. Table 15. Wrong Precinct Voting Cross-Vote Probabilities. In Cuyahoga County 2004, voters were rolls of the dice, and each vote was an event—one roll of the dice with alarming odds a vote counted opposite the voter's intention. Actual voter numbers in each probability subset, not the precinct averages, define precise overall probabilities and size disparity skews even random cross-vote outcome probability. Table 16 presents 2\3 locations sorted by Kerry-Bush vote-switch probability. One striking statistic in this small subset is the disproportionate sizes of the precincts. The ballot order with a 1.0 probability that Kerry cross-votes tally for Bush was assigned to precincts on average with 50% more voters. the probability Kerry cross-votes can be switched to Bush votes increases. Table 17 presents county-wide cross-vote outcome probabilities. The official results indicate 39,388 of 525,172 Kerry wrong-precinct voters would vote as intended, so overall K-K P = 0.075. Two specific pairings of cross-votes, Kerry with disqualified and Badnarik with Peroutka, is clearly illustrated by the probabilities. Figure 1 and Table 2 also illustrate probability pairing patterns (further discussed below). In Table 17 the skewed probabilities of the 2\2 subset reflect the overall population size disparities seen in Figure 6 below. The ballot orders were combined such that Kerry and Bush are collocated most often. Significantly more ballot combinations switch Kerry cross-votes to Bush and to disqualified than to the third party candidates. In the largest subset, the 2\2 subset with cross-vote outcome P = 1.0, the imbalance is most exaggerated with K-B skewed from the random expectation of P = 1/4 to P = 1/3. Table 17. Cross-Vote Outcome Probabilities. Outcome probabilities of wrong-precinct voting favor Kerry to Bush vote-switching. An important aspect of descriptive statistics is initial examination, assessing basic properties of the data. Finding natural divisions or subsets in a dataset enables comparative analyses. Pairing is an important analytic tool. For example, pairing allows survey of whether wives and husbands agree rather than just whether men and women agree. As seen in the wrong-precinct voting examples (Tables 8 to 11), when Kerry cross-votes switch to Bush for one precinct, an adjacent precinct cross-votes Kerry to disqualified. In like manner, Kerry cross-votes to Badnarik and to Peroutka are paired. These pairings determine cross-vote outcome patterns, and examination of the vote results for evidence of the patterns can measure cross-voting and vote-switching. Table 18 presents a comparison between random probability and the actual K-B and K-b cross-vote probability for the major ballot order and precinct combinations. Note the number of voters in each subset and the relation of the voter numbers to the probabilities, number of voters correlates positively with K-B P (0.47) and negatively with K-b P (-0.52). The pattern of ballot order combinations favors the K-B vote-switch probability. The only subset with a skew slighting vote-switching to Bush is locations with 2 ballot orders and more precincts. Due to cross-vote outcome pairing, the K-d and K-p probabilities closely parallel K-B and K-b respectively. Table 18. K-B Vote-Switch Probabilities. All Cross-Voting Precincts Sorted by Ballot Order\Precinct Combinations. Figure 6 presents all precincts with 1.0 cross-vote probability sorted by outcome of Kerry cross-votes. The pairing of cross-vote outcome probability is apparent by subset sizes. The precinct count and voter population data illustrate the subset deviations from normal distribution. While 123 precincts vote-switch Kerry to Bush, only 76 cross-vote Kerry to Badnarik. If the distribution of ballot order combinations were normal, the precinct count and voter numbers subsets would equal near 25% each. Non-random distribution of ballot order combinations skews the cross-vote outcome probabilities, heavily favoring K-B vote-switching. The combinations of ballot orders and precincts favor Kerry to Bush vote-switching. Kerry Support, Cross-Voting, and Vote-Switching. Random cross-voting should be just that, random, and an expectation of normal distribution follows. 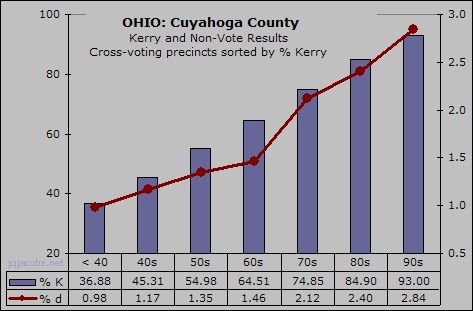 In Cuyahoga County, not only do the combinations of ballot orders and precincts favor Kerry to Bush vote-switching, cross-voting is most evidenced in areas with highest Kerry support. A non-random pattern is expected if cross-voting results from manipulations to deprive Kerry of votes. Figure 7 illustrates how precincts with higher vote-switch probability are located in areas of significantly higher Kerry support. Figure 8 demonstrates how Kerry cross-voting to disqualified is apparently highest in precincts with the highest probability a Kerry cross-voter voted disqualified. Because Kerry-Bush vote-switching is paired with K-d cross-voting at the locations, this cross-voting trend also indicates greater K-B vote-switching in areas of highest Kerry support. Non-votes in Cuyahoga County represents ballots without a vote for President, spoiled ballots, as well as cross-vote ballots punched for this unusual, uncounted, no-candidate option. Just as probability sorting evidenced third-party cross-voting, a correlation likewise exists for K-d cross-voting probability and non-vote results. For all precincts, Kerry support also correlates (0.42) to the percentage of non-votes. If about half of non-voting is Kerry cross-voting, then near one percent of non-votes were Kerry votes—an alarming amount relative to the number of switched votes needed to reverse the election outcome. Figure 9 illustrates the relation of ballot order combinations to candidate support. The combinations with the highest probability of vote-switching are located in areas of highest Kerry support. Figure 10 illustrates how the largest populations subsets are the high Kerry support areas with the highest probability of cross-voting. These variables combine to maximize vote-switching in Kerry areas. The factors presented in Tables 5 to 10 must be considered as a whole. Their interrelationships raise strong suspicions of purposeful arrangement of precincts and ballot orders in areas of high Kerry support to facilitate altering the outcome of the election. On election morning, the dice were loaded and ready. Kerry's losses to random cross-voting were disproportionately high due to higher Kerry support, then compounded by the larger subsets with the highest probabilities concentrated in higher Kerry support areas, then further compounded by a higher proportion of vote-switching precincts. The higher proportion of vote-switching precincts also reduces the proportion of obvious indicator cross-votes to disqualified and the third-party candidates, effectively a built-in obfuscation. Roll those dice, and add the possibility of intentional irregularities and ballot switching. had wanted to limit switched votes, they did everything possible wrong! If they wanted to hide switched votes, they did everything right! To infer the degree of cross-voting and vote-switching, I shifted analysis from descriptive parameters to comparisons of cross-vote outcome subsets. Probability sorting provides a refinement for statistical analysis. Cross-vote probabilites isolate outcome subsets, providing comparisons to quantify cross-voting. Descriptive analysis revealed the population subsets, how precincts and probability outcomes are paired, and how distinct ballot order combinations present different possible methods for analysis. Precinct pairing at locations facilitates analysis because an expectation of near equal average candidate support exists for geographically adjacent precincts. Probability pairing provides additional useful subsets. Distinct probability sorts of the same population enables further comparisons. Sorting precincts by cross-vote outcome produced direct evidence of cross-voting, as depicted again below in Figure 1 illustrating 2\2 precincts sorted by Kerry cross-votes. Sorting by the probability Kerry cross-votes count for Badnarik (P-b P = 1.0) illustrates the five-fold increase in Badnarik votes. Sorting the same precincts by K-p P = 1.0 illustrates 9.5 times more Peroutka votes. Figure 1 clearly infers cross-voting due to Kerry cross-votes. The inferred amount of cross-voting in this comparison is based on an expectation, the vote rate in all the other (P = 0) 2\2 precincts. Vote results significantly depart from expectations in these paired subsets, with under 10% of voters reporting over 38% of Peroutka votes plus over 23% of Badnarik votes. The K-p P = 1.0 subset with 4.9% of possible cross-voters records 34% of the Peroutka votes and the K-b = 1.0 subset with 4.8% of possible cross-voters records 20% of the Badnarik vote. Descriptive statistics of election results is like a census break down, based on a full tally of a population. Of course, a census does not depend on precinct chain of custody. In a census analogy, a biologist recording parent pairs knows there is an error if there are more fathers than mothers. For election results, the precise 50% ratio of genetic pairings is not expected and precinct combinations are more complex than genetic pairings. Nonetheless, deviation from expected values infers the degree of "error" and statistical methods can quantify cross-voting and vote-switching. The results in Table 19 are unexpected given the data in Figure 7, illustrating precincts with higher Kerry-Bush vote-switch probability correlated to areas of higher Kerry support. Skewed results are expected given the data in Figure 9, illustrating the Kerry support correlation with ballot order combinations. The average number of precincts per location is different for these two subsets, 3.84 for the K-B P > 0 subset and 2.94 for K-B P = 0. Locations with four and five precincts average lower Kerry support, and their predominant distribution in the K-B P > 0 subset skews any expectation of equal results. Understanding the descriptive statistics, especially subsets and their respective variables, is an important first step when considering if subset vote averages are expected to be equal or varied due to variations in neighborhood candidate support. Comparing more delimited subsets can refine expectations that central tendency, dispersion, symmetry, and shape of the data subsets will be equal. While adjacent precincts differ in how ballot chain of custody errors count, their candidate support levels are expected to average near equal. Subsets with paired precincts at each location should average near equal results, and, therefore, provide more conclusive analyses. Different location subsets also present distinct analytic possibilities and problems, and this variation allows addressing diverse questions. The 2\2 population is large and has one possible Kerry cross-vote outcome per precinct, providing various definitive comparisons. The 5\5 population is small, a statistical negative, and lacks comparative subsets with identical cross-vote probabilities for each precinct. The 4\4 locations provide equal cross-vote probabilities, and the precincts provide delimited cross-vote probabilities. The 3\3 locations also have several, delimited cross-vote probabilities. Locations with three or four ballot orders uniquely allow comparisons of the same data sorted using distinct probability subsets. Locations with more precincts than ballot orders present small, statistically less robust subsets and more complicated determination of expectations. Table 20. Comparisons of Probability Subsets for 2\3 and 3\3 Locations. The 4\4 subset consists of 27 identical locations, each with four precincts and four ballot orders. In this subset, the expectation prevails that precinct Kerry results average near the same. One precinct per location cannot vote-switch while three can. Table 21 presents the 4\4 probability matrix with two distinct sorts of the same precincts. Table 22 presents a results comparison for the same probability sorts. The three-fourths of precincts where a Kerry cross-vote can count for Bush (K-B P = 1/3) have a 6.29% lower Kerry margin. The 4\4 locations present about the same 6% Kerry margin disparity seen in the 2\3 and 3\3 subset above. Again, the Kerry and Bush results are near equal as expected when sorted by K-b probability. Table 21. Probability Matrices for 4\4 Location Subset. If cross-voting is random and inadvertent, a statistical expectation prevails, that cross-voting will be approximately equal to probability. Notably in the 3\3 and 4\4 population, third-party rates do not increase comparable to the 2\2 subset shown in Figure 1. Instead, the shift is in Kerry and Bush votes. Kerry to third party cross-voting is concentrated at locations where vote-switching is not possible. When the 4\4 population is sorted by K-b probabilities, Kerry voting is equal. Sorting the same population by vote-switching probability distinguishes a 6.3% difference in Kerry margins. This result infers about three percent of Kerry votes were switched to Bush. Random cross-voting can NOT explain the disparities revealed by comparison of distinct cross-vote probability subsets. Fraudulent Kerry-Bush vote-switching cannot be ruled out. Table 22. Results Comparisons for 4\4 Probability Subsets. when the population is sorted by outcomes of wrong-precinct voting. Statistics offers inferential methods to test populations against expectations. Unlike in genetic pairing, precisely the same Kerry vote cannot be expected for all precincts. 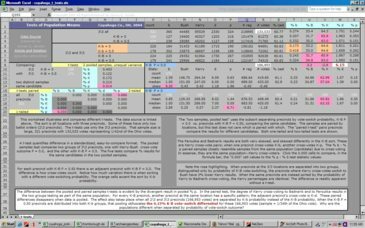 Significance testing determines if variable differences are outside the range of expectation. Population characteristics are parameters and sample characteristics are statistical. Known values of populations, precise descriptive statistics, are often unknown and polling (sampling) is employed to hypothesize population characteristics. With election results, the population parameters are known and the subsets are known samples, providing robust, reliable testing to evidence irregularities. A t-test quantifies difference in a standardized, easy-to-compare, probability format. A paired t-test of all 1,255 cross-voting precincts indicates an astounding 0.862 probability Peroutka and Badnarik voters are the same population. The actual probability so many voters for different candidates test probable as the same populations is infinitely miniscule. The test results positive with such high probability because the Peroutka and Badnarik vote patterns are largely the same population, Kerry cross-voters. Kerry cross-votes counted as Peroutka and Badnarik votes out weights their actual vote patterns. For every K-b precinct, an adjacent precinct cross-votes K-p, and at locations where one precinct cross-votes, this unusual application of a t-test evidences the other is likely doing so also. T-tests comparing location-paired precinct data reinforce evidence of a strong correlation between locations and Kerry to third-party cross-voting. T-tests applied to Kerry and Bush vote results in Table 20 and Table 22 support the evidence of Kerry-Bush vote-switching. T-test results and more subset comparisons are highlighted in the spreadsheets. led to voting irregularities and any failure of votes to be properly counted." Statistical analysis can reveal patterns produced by cross-voting or vote-switching. A potentially useful aspect of the election results for determining numbers of cross-votes, particularly those not evident using results for one race, might be statistical comparison with down-ticket races using cross-voting probability sorts as defined herein. Precinct-level pairing of cross-voting in diverse races can be analyzed, especially so where vote-switching produces a down ticket pattern not correlated with party. Also, comparison with 2006 e-voting results may reveal patterns of change correlating to punch card cross-voting in previous elections, especially regarding spoilage rates. Given the number of miscounted 2004 votes in Cuyahoga County, results in other Ohio counties and other elections need to be analyzed for irregularities, especially wherever more than one ballot order was employed at a punch card voting location. The same needs to be accomplished for past Ohio elections. The results herein bring into question all past Ohio punch card voting. The methods presented enable a review of past punch card voting for ballot-box stuffing as discussed herein, either casting at or switching ballots to the wrong precinct. This study has not considered the history of decisions that created the Cuyahoga County election. Given the irregularities noted, the decisions in that process, particularly organization of precincts, ballot orders, and locations, and why these factors combined as they did to Bush's advantage, should receive official review in the light of the post-election results evidencing cross-voting. Because the situation resulted in election results different from the votes cast, an official inquiry into all aspects of the process should take place. In particular, the strong correlation between minority populations and both non-vote percentages and cross-voting also requires a civil rights investigation. I did not anticipate the complexities of Cuyahoga County's election organization or the resultant amount of work required to fully and accurately answer the questions first posed. The number of Ohio Kerry votes switched to Bush votes remains to be fully quantified state-wide. While a precise answer may not be attainable everywhere, statistical analysis can provide a useful answer. Cross-vote outcome probability sorting quantified obvious chain of custody error in the results. The degree of miscounting is far more than I initially thought, more than would be expected under random circumstances, and not random at all. The degree of vote-switching exceeding the election margin in several large subsets is especially alarming. Given the Presidential election hinged on the Ohio result, cross-voting certainly deserves further investigation for all precincts in Ohio. Until all previous punch card elections in Ohio are analyzed, how flawed Ohio elections were remains a mystery. April 28 , 2008. Analyses and research continues. I will continue updating this page. Highlighted cells in the spreadsheets display analyses not yet presented herein. More charts are also found in the spreadsheets and spreadsheets will update also. The 2004 Ohio Presidential voting results do not accurately reflect voter intentions. In Cuyahoga County, the election was flawed and the design appears to have been manipulated. At locations with several ballot orders in use, many votes were cast by voters crossing precincts, hence counted other than as intended. At precincts with the highest Kerry support, the percentage of uncounted votes is inexplicably high. The obvious inference—intentional manipulation produced concentrated undercounting, cross-voting, and vote-switching in areas of highest Kerry support—cannot be ignored in the face of the evidence and statistics. The possibility that ballots were switched to different precincts, post-voting to effect vote-switching, must be considered in a complete chain of custody context. Many individual ballots resulted in a vote-switch, a two-vote margin difference from the intended result. Switched-votes cast for Kerry and counted for Bush had twice the impact as their actual occurrence, by each subtracting one from Kerry and adding one to Bush. Bush and Kerry votes also went uncounted as non-votes or were miscounted as minor candidate votes. A high percentage of all Cuyahoga County votes were cast at locations with multiple ballot orders. The manner in which precincts and ballot orders were combined increased the probability of a Kerry cross-vote being recorded as a Bush vote. Quantitative analyses of candidate votes and of non-vote percentages evidence the cross-voting and the patterns of cross-voting and vote-switching. Sorting locations and precincts to their specific cross-voting probability subsets reveals intended voting patterns and the degree of cross-voting. The combinations of ballot orders and precincts at polling locations enables quantitative analysis of cross-voting and vote-switching. The complexity of the election's organization—the great number of combinations of ballot orders and locations—also makes the task of determining the number of cross-votes laborious and complex. While that process is not concluded herein, the procedures so far taken in this study define the process. This process may be more easily applied to other Ohio counties given less-complex ballot order combinations. Any official inquiry into the 2004 irregularities needs to be independent of political interests, and monitored by political interests. The fact that the irregularities discussed herein are known and have been reported to multiple jurisdictions and law enforcement entities, and yet no official inquiry into the election has occurred, illustrates the broader failure of the current election process and judicial system to respond to election fraud and irregularities or to hold officials accountable for their actions. Polling places should never have been arranged such as in Ohio, with multiple ballot orders and separate casting and counting devices. Measures are required to prevent the possibility of similar future flawed election designs. To this end, control of elections should be removed from competing political interests and actors to politically-independent processes, with at the least, independent and political oversight of elections. Many more conclusions remain to be made as study and analysis continues. The 2004 Ohio election ballots must be preserved to allow further investigations. If this study illustrates anything, hopefully it is the degree to which this problem has not yet been fully considered, and the complete failure of officials to respond. During an era of new voting system technologies and reforms, careful consideration of past errors may prove useful in avoiding their repetition and in preventing future abuses of process and power. The 2004 Ohio Presidential election remains to be fully investigated. The blatant evidence of irregularities and unfairness of organization continues to be ignored by most jurisdictional authorities informed of the evidence. I thank those few authorities pursuing this matter further. 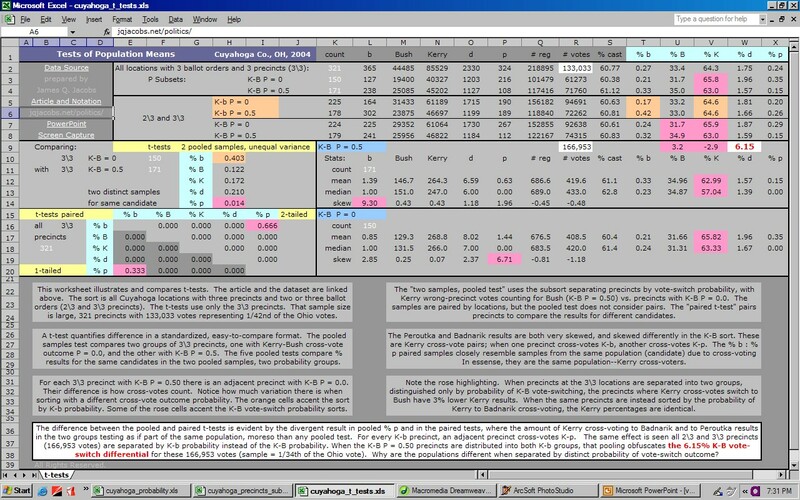 Download the hi-res deskpicture screen capture of cuyahoga_t_tests.xls. The Cuyahoga County data I used was complied into Excel files by Joe Knapp using the Cuyahoga Board of Elections online resources. The spreadsheets I utilized in this analysis are available online and linked above in the preface. Ohio recount - Cuyahoga County ballots pre-sorted 2004.12.18 "Anomalies were found. Almost all of the witnesses that I spoke with felt that the ballots were not in random order, that they had been previously sorted. There would be long spurts of votes for only one candidate and then long spurts for another, which seemed statistically improbable to most. ©2008. All Rights Reserved by James Q. Jacobs.